EXCERPT: "Faulk has made a career out of trying to shine a light on injustice, whether it’s equal pay or prison reform. 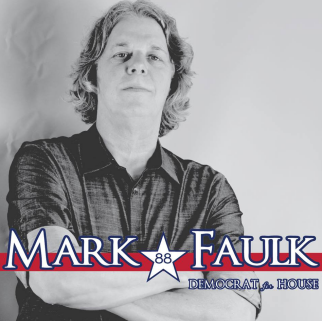 While Faulk realizes a position as a Democrat in Oklahoma’s Capitol will carry little voting power, he plans to use the position as an opportunity to speak out for progressive issues." Overcoming Poverty is an Act of Justice Like most things involving money, if you’re broke, you pay more. For Mark, House District 88 is more than just a political designation, it is his home. He opened his first bank account at the Gold Dome in 1973, graduated from Classen High School in 1974, and has been deeply involved in social political activism, the music scene, and the arts in Oklahoma his entire life. "I believe, with all my heart and soul, that Oklahomans have the courage to stand by their convictions, to cast timidity aside and reclaim our populist heritage." Copyright © 2014 Mark Faulk For House. All rights reserved.